It’s a funny old business this entomology lark. I came across this large beetle whilst carrying out my monthly Riverfly survey on the River Og in Marlborough. After a bit of research I discovered it was a Lesser Stag Beetle Dorcus parallelipipedus which is normally found in deciduous woods. It feeds on sap and breeds in rotting stumps, particularly Ash, Beech and Apple. Then a week later I found one walking across my kitchen floor. Well there are no trees in the kitchen but the units themselves are certainly in a state of decay. Shortly they will find themselves in a recycling skip. The time has come to install the new kitchen that has been stacked in the lounge for the past 3 years. Anyway, in terms of identification it can only really be confused with the much rarer female stag beetle, but whereas she often has dark chestnut-brown wing cases (elytra) this beetle is in comparison smaller, flatter and all black. In addition, the head of the female stag beetle is smaller than the thorax, but as you can see, this chap, and it’s even more noticeable in the male, has a head almost the width of its thorax. 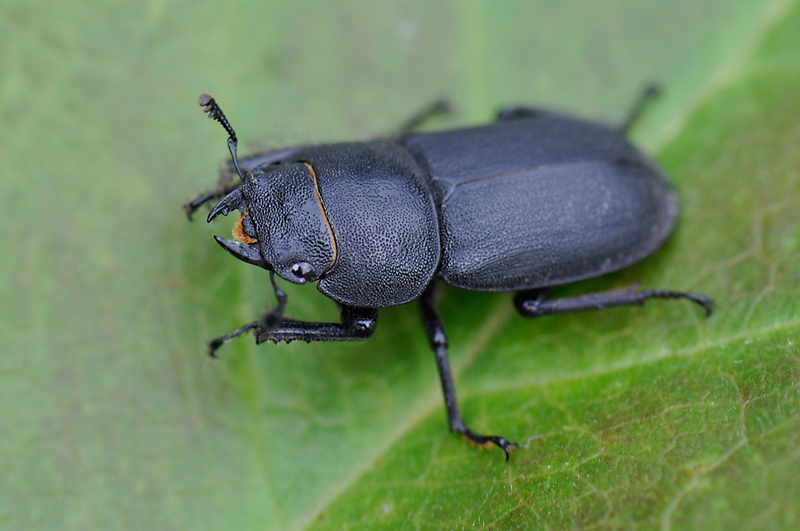 If you’re still not sure, the lesser stag beetle has only one tooth (spur) on its middle tibia (middle section of its middle leg), the female stag beetle has two. And finally, take a look at those jaws, much bigger. Mess with this little bruiser and I bet it could give you quite a nip. I like the armour-plated almost tank-like quality of this beetle. The slightly pitted surface of its exoskeleton makes it look like it’s built out of cast iron. If it got scratched or chipped you could almost imagine yourself touching up the damage with Hammerite.